We are very proud of recruiting only the finest complementary therapists and practitioners that are specialised in alternative medicine, complementary medicine and first-class patient care. 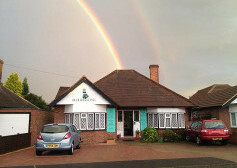 Here where you will find the highest level of expertise in a range of alternative and complementary therapies including Osteopathy, Homeopathy, Massage, Shiatsu, -Podiatry-Chiropody, Alexander Technique, Yogatherapy, Psychotherapy, Acupuncture, Western Herbal Medicine Chinese Herbal Medicine, Nutrition, Mindfulness and Coaching, Aromatherapy, Reflexology, Reiki, Skin Clinic, - all under one roof. There is Free Parking on drive, however during busy periods then please feel free to park behind staff cars. No parking on yellow line between 11.00am-12noon (only) .2 hour no return spaces at end of orchard lane. NO parking in Saxon Close.